The GE NetworX platform provides flexibility and scalability for applications from small businesses up to large integrated systems. With this universal programming and unparalleled support, GE NetworX is the solution for you. The NetworX NX-8-CF is a UL listed 12V commercial fire/intrusion panel that is ideal for commercial applications. The NX-1700E SmartReader lets you control access and track employee entry/exit activity with a simple card or key fob. You can restrict access by individual based on job function, time of day or location for up to 15 doors. You can even print activity logs. NetworX offers cellular back-up on your security system if you lose service or your lines get cut. GE Interlogix offers a complete line of easy-to-install wireless components to complement the NetworX system. 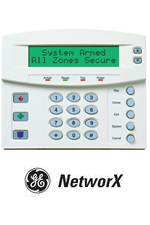 You can tailor a security system to your needs without extensive wiring. Our PinPoint Addressable Two-Wire Point ID System is the right choice when extensive wire runs are needed to install traditional systems. NetworX systems come standard with an RS-232 two-way communications port. Control lighting, heating, and other devices through building automation systems. With this feature, you’re always current with future technology advances. Thanks to our TCP/IP interface and network server, you can monitor your system on the Internet. All it takes is a broadband connection.